This product has been superseded by the AS9000 . Please click here for more information. The AS 7000 Transcription Kit includes a 4 button footswitch and stereo headset to ensure ergonomic working by the transcriptionist. 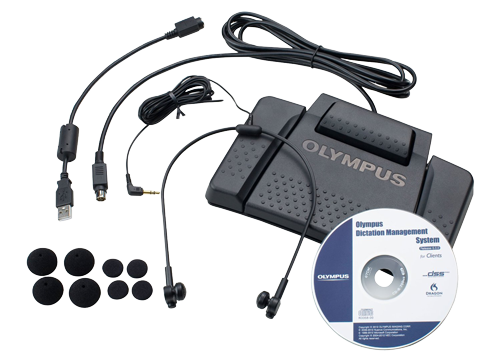 In addition, process efficiency is optimised thanks to the new "Olympus Dictation Management System Transcription Module" bundled with this Transcription Kit. Besides making secure file management easier than ever before, it offers multiple file transfer options to suit individual requirements. Full Citrix and Terminal Service support is provided and it is compatible with POP3, SMTP, and extended MAPI email environments. Moreover, SSL support for email/ftp is also included. Corresponding solution: Professional Transcription Software For (detailed) software functions of Olympus dictation management software please refer to the relevant software pages. Dimensions: For dimensions and weight of the single articles of the package please refer to the relevant web pages of the single articles.